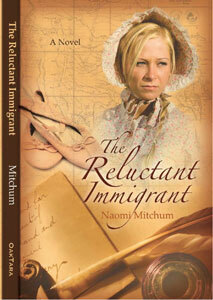 An historical novel about an immigrant who goes to New Braunfels, Texas in 1846. This young adult fiction is filled with quirky, bigger-than-life characters, teenage romance and German culture. Everyone has secrets. Rika has hers packed away in her new-fangled carrying purse, but she made no secret of the fact that she didn’t want to leave her beautiful home in Germany for the Texas frontier. She just wanted to stay home and sing, sing, sing. Instead, she must walk, walk, walk next to oxen and a covered wagon while also taking care of a sick mother and a stuttering, whiny sister. Thank goodness for Engel from the next wagon, who does chicken imitations of his mother, and Karl, the cocky German soldier, Lux, the talented young carpenter, and Oma Gunkel and her entertaining imaginary husband. The trip is both blessed and cursed by a couple of crooks and by Baya, a cranky, Spanish hearing horse who doesn’t understand Rika’s German. Along the trail, Rika is surprised by the faith she thought belonged to her mother.